The month hasn't finished really yet, nevertheless Eurostat manages to produce a flash estimate of the Euro are inflation. Euro area annual inflation is expected to be 2.7% in May 2011 according Eurostat, the statistical office of the European Union. It was 2.8% in April. A recent analysis by the Moody's Capital Markets Research Group -- "Eurostat Plays Cassandra, and the Markets are a Willing Audience" -- brought up an interesting point. Europe's statistical agency, Eurostat, had improved EU-wide oversight of government debt and budget deficits. This means that a number of "off-balance sheet" items that Europeans had moved off their books to make their deficits and debt levels more palatable have now been put back on the menu. The euro area (EA16) seasonally-adjusted unemployment rate was 10.0% in December 2010, unchanged compared with November4. It was 9.9% in December 2009. 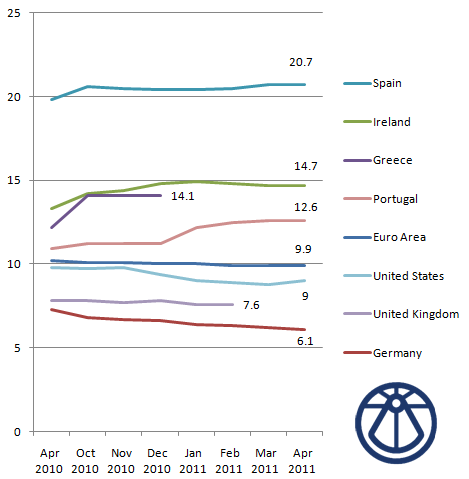 The EU27 unemployment rate was 9.6% in December 2010, unchanged compared with November. It was 9.5% in December 2009. Rising fuel prices helped push annual eurozone inflation up to 2.2% in December, from 1.9% in November, according to official figures. Consumer prices in countries using the euro climbed 0.6% on a monthly basis, Eurostat added. The data comes one day after the head of the European Central Bank (ECB) warned the region was threatened by rising prices. The ECB has a target of 2% for eurozone inflation. A year ago it stood at 0.9%. More expensive fuel has a particular impact on the cost of transport and of food production and delivery.